Both the Bison men’s and women’s volleyball teams preserved their perfect records with victories over the Calgary Dinos on Nov. 1 and 2. On Thursday night, the Manitoba women nearly let Calgary force a fifth set, but managed to shut down a desperate Dino team in the fourth to secure a 3-1 victory (25-20, 19-25, 25-13, 25-23). Rachel Cockrell and Emily Erickson were the players of the match, as they led the Bisons’ offensive attack. Cockrell led all players with 19 kills, while Erickson had the second-most kills on the team, including four service aces. The men finished the night by quickly and effectively putting the Dinos away in straight sets, 3-0 (25-13, 25-19, 25-17). The Bisons were stronger offensively and defensively; Dane Pischke led all players with 13 kills, while first year middle hitter Kenny Rooney showed his defensive prowess, helping with nine blocks of the night. The following day, Calgary took the Bisons women to the limit with a five-set match that the Bisons ultimately won 3-2 (25-27, 25-17, 25-17, 14-25, 15-9). Three Bisons players had kills in the double digits: Cockrell (17), Crystal Mulder (16), and Erickson (12). 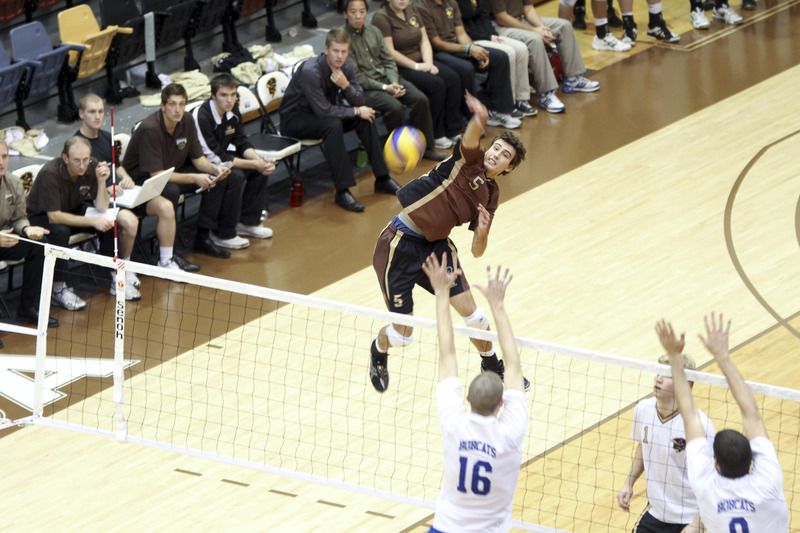 The men finished the road trip with a win over Calgary 3-1 (15-25, 25-19, 25-18, 25-14). The win keeps their perfect record intact and sees them tied at the top of the standings with Alberta. The Bisons will face some stiff competition this upcoming weekend as they visit their cross-province rivals, the Brandon Bobcats, for two evenings of volleyball on Nov. 9 and 10.